Without monthly condo fees paid by condo owners, condo corporations would cease to exist. The Condo Act gives condo corporations extraordinary rights to enforce the collection of these monies required to maintain what are described as common expenses. 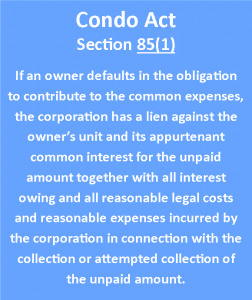 Section 85 of the Condo Act provides the condo corporation with the right to collect unpaid amounts along with interest and legal costs. This is called a lien and it takes priority over most other debts of the individual. For a condo corporation to collect monies due, they are required to take certain steps. Failure to follow the proper steps and timing in this process can result in a condo corporation being unable to collect on this debt. For more information on the condo lien process, see When Common Expense Fees are not Paid in the Condo Archives – Financial Management, subheading Condo Fees.